Region Name: Adilabad, Karimnagar, Khammam, Warangal, RangaReddy, Hyderabad, Medak, Nizamabad, Mahaboobnagar and Nalgonda. 2. The students should have studied in a recognized school, either in Telugu Medium or English Medium. 4. The parental income should be Rs.1,50,000/- in Rural areas and Rs.2,00,000/- in Urban areas per Annum. 4. In remaining TSWR Schools the admissions will be taken up based on availability of vacancies. 2) Admission will be given as per merit obtained in Telangana-SWAEROCET 2018 and the preference of institution given by the student in online application. 1. The test will be held on 03-06-2018 from 11 :00 AM to 01: 00 PM for maximum marks of 100. 2. Admission test will be held in English, Mathematics and Environmental Science based on State Syllabus of 5th class/6th class/7th class/8th class prescribed by Telangana State Government. Submission of Applications and Entrance Examination Centers : All the students who are seeking admission into VIII and IX classes for the year 2018-2019 into COE Karimnagar and the students who are seeking admissions into VI to IX class in other TSWR Schools of backlog vacancies should apply through online mode. 1. The Girls and Boys from all Districts in Telangana State can apply for admission into COE Karimangar for classes VIII and IX as it is Co-Education. 2. The candidates should select “concerned class in online application (Ex. VI class / VII class / VIII class / IX class) and submit it through online. 3. In other TSWR Schools the Boys will be provided admission in boys schools and girls in girls schools. 4. Candidates are advised to take printout of filled in application form and download the Hall ticket from 08.06.2018 to 10.06.2018. 5. Test will be conducted on 18.06.2018 at the centre Name mentioned in the hall ticket at 11:00 AM. 6. Minimum qualifying marks in the Entrance Test will be 40% for Maths, 40% for Science, 40% for English and 25% for Current affairs & aptitude/Mental Ability. 7. The selection of candidates will be purely on written test merit only. 8. Only those candidates will be selected who have secured 40% marks in each of the subject and 25% marks in Current affairs/Mental Ability and aptitude and passed V to VIII classes in the academic year 2016-17 respectively. 9. The candidates should attend the counseling on the scheduled dates and centres. 10. The selected students will be allotted to the districts from which they have completed their previous classes. 11. In case of any issues related to the interpretation of admission guidelines, the decision of the Secretary will be final before and after the admission process. 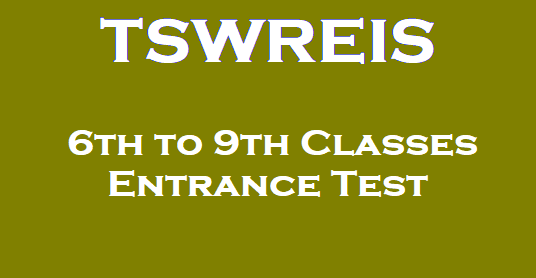 Web Note: The TSWREIS has extended the last date for submission of online applications for admission into 6th to 9th class backlog vacancies. The last date for submission of online applications is mentioed below. The candidates are advised visit the TSWREI Society website for online application form and other details, according to its Secretary.